Spectroscopic methods are utilized widely for characterizing minerals and other geomaterials in terms of electronic, vibrational and nuclear properties. 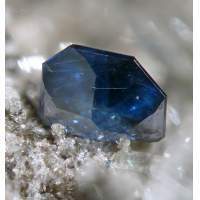 The basics and applications of spectroscopic methods in mineralogy were reported comprehensively by Hawthorne (1988), and later discussed carefully and updated by Burns (1993) and Clark (1999), by Beran and Libowitzky (2004) and more recently by Henderson et al. (2014). These esteemed books and reviews focused generally on topics of immediate mineralogical interest, but nevertheless contain stimulating parallel excursions into the fields of geology and materials sciences. This chapter is built on the shoulders of those giants and is devoted specifically to exploring spectroscopic investigations of electronic and nuclear properties of mineral fibres, a topic not reviewed previously. A number of spectroscopies (though not all) will be mentioned without covering in detail their physical bases (which can be found easily in the books and reviews mentioned above), because this chapter is intended to serve as a review of their contribution to increasing comprehension of the bulk properties of mineral fibres.